The article was originally published on November 30th, 2010, at 11:11 AM. It was improved, corrected and republished. The expert on strange phenomena, and also the leader of operations for the Romanian State, Cezar Brad, is the “hero” of the shocking events that occurred in the Bucegi Mountains. In May 2003, Cezar was visited by a highly important character. The meeting request came through SRI, as a result of the government’s intervention. The person was a foreigner, but spoke the Romanian language very well. He was also familiar with the country. The SRI informed Cezar that the visitor was a high ranking member of a very important Masonic lodge from Italy, he was a noble, and had very strong financial influence in Romania. His political influence was also very high, since he was able to penetrate the wall of SRI agents and reach the DZ. (Apparently, Romania is probable to play an important role in the downfall of the secret societies that control the world and enslave mankind. It was also suggested that somewhere above the Bucegi Mountains, an energetic pyramid is located, which is invisible to the naked eye, and contains the real history of our planet. One can imagine their panic). The U.S. adviser on national security issues received a call and he was notified that the energetic shield from Baghdad, Iraq, had been suddenly activated, and it was also pulsating at a higher frequency. In front of the shield from Baghdad, a hologram of our planet appeared, which sequentially and progressively depicted the European Continent, then moved to the south-east, then it showed the Bucegi Mountains from Romania and, finally, it showed their own location within the structure’s corridor. It was obvious that the two hemispherical energy shields were in a direct connection. When the U.S. diplomacy had been informed that Romania will disclose the discoveries, everything tuned into chaos. The President was called for a direct phone conversation with the White House. Within hours, the U.S. blocked all financial transactions with Romania and its access to all other financial institutions. Romania was about to declare “State of emergency” in the Bucegi Mountains and the capital. Romania’s official disclosure to the world would have provided photographic evidence and anything else essential for a complete clarification. Leading scientists and researchers from all over the planet were to be invited for in depth studies. But most importantly, it would have revealed the truth about mankind’s distant past and the real history — which according to what Cezar witnessed inside the Grand Gallery, is almost entirely counterfeit. The Grand Gallery ended abruptly with a giant auditorium, 30 meters in height (98,5 feet) and a length of 100 meters (328 feet). The Projection Room was smaller in size and it was protected by an energetic shield. Advancing towards the shield, a portion of it disappeared, in the shape of a door, allowing access inside it. The shield protected the room by any outside influences. Once inside the room, the shield became compact and looked like a white-golden wall. Basically, the shield formed this dome-shaped room, with curved walls and ceiling. At the back of the room, at a height of a about 10-12 meters (33-39,5 feet), the shield ended where it touched the room’s stone wall. In this wall there were three enormous tunnel holes: one located straight ahead, and the other two were symmetrical on both sides. They were lit by a diffuse light in a greenish tint. Both sides decided to prohibit the access to these tunnels and a protocol was signed between them. A series of huge stone tables were arranged along the right and left walls (five on each side), following their curvature. The tables were about 2 meters in height (6,6 feet). The table tops had precision cut-in reliefs, different signs of an unknown writing and characters that resembled ancient cuneiform. The writing also contained more general symbols, such as triangles and circles. Although the signs were not painted, they’ve had a fluorescent light radiating in various colors, different for each table. The gold powder in its pure form greatly stimulates certain waves and energy exchanges at cellular and neural level. This causes an accelerated process of rejuvenation. Theoretically, a man can live in the same physical body for several thousand years, provided they consume from time to time, a well-defined quantity of monatomic gold powder. This explains many puzzling aspects about the incredible longevity of some important figures and uncovers part of the hidden intentions of the global elite. The right tunnel led to a similar but smaller structure, in the “Tibetan Plateau”. This tunnel had three secondary ramifications. 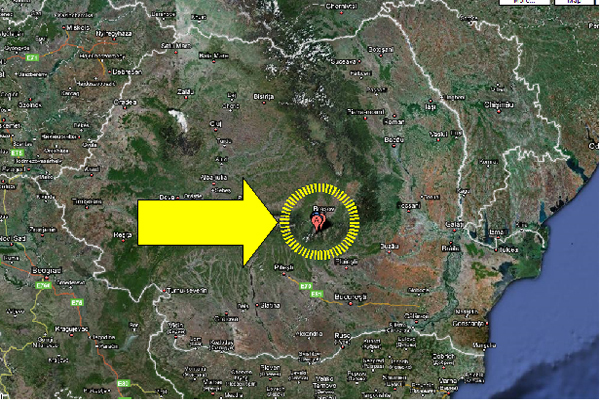 One led to an underground area near the Romanian city of Buzaru (close to the “Carpathian Bend”). Another one led to the already mentioned Iraqi base, while the final ramification led to an underground base in the “Gobi Desert”, in Mongolia. The middle tunnel was the most important to both Lord Massini and the U.S. Government, which strongly requested to be kept secret to the public. This tunnel descended to extreme depths towards a veritable underground world, located near the center of our planet. Those of you who are not familiar to the hollow earth theory, please note that there are important figures who support the theory that all planets are probably hollow on the inside, and bring interesting scientific arguments to support their claims. Also, there are some very interesting and beautiful stories about people who allegedly traveled to this world. The realm is commonly known as Agartha, and the third tunnel was probably leading straight to it. It only makes sense that the shadow elite were not interested to make the discovery known to the people.